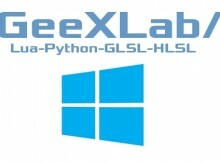 A new version of GeeXLab for Windows (32 and 64-bit) is available. The internal TCP server is also missing on Linux, OS X and Raspberry Pi versions of GeeXLab. A soon as GeeXLab will be recompiled for those platforms, you will be able to play with remote live coding (especially handy on the Raspberry Pi!). You can download GeexLab 0.9.5.1 from THIS PAGE.